Very easy to use and lots of hairstyles and colors to choose from. Love this app easy to use if you follow the steps... Lol gave me so many new ideas and also great fun to use it on other people. I even did one of my dog just for fun!! I tried some free apps for trying on hairstyles and none of them worked. 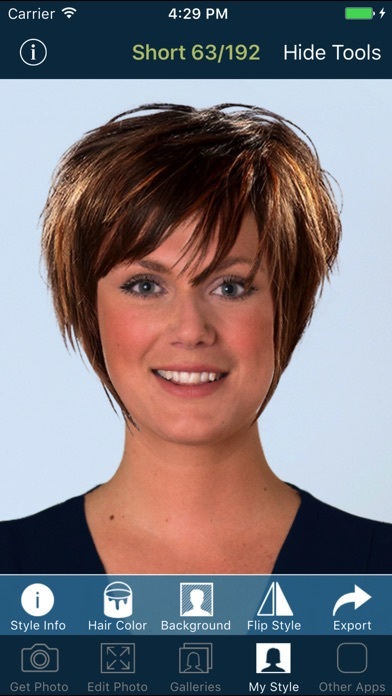 I tried this to see how my daughter would look in short hair, like she is wanting to get. This was great! It even lets you pick the color of hair and even has the funky colors to choose from as well as regular colors. Lots of hair styles too! This is exactly what I was looking for. Love it! Best Hairstyle App Out There! I have tried all the various hairstyle apps in the app store and this one is by far the best. It has lots of different choices, for short, medium and long hair, and tons of hair color options. It even has a mens section so you can have fun with your man too. It's very easy to use, highly realistic, and it gave me lots of great ideas. I highly recommend this app! 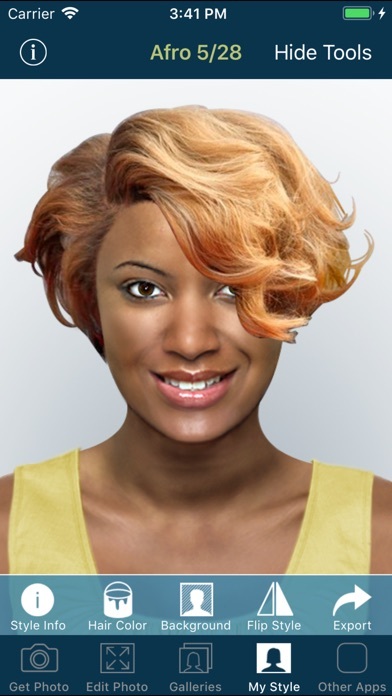 I purchased this app along with the makeover app because I really want a new hairstyle. This app is awesome, you can change the angle and direction of your face, change the color for each specific style it is AWESOME!! I hope they keep improving it. The colors and style look very real. DO NOT buy the makeover app it was $1.99 and pure junk compared to this!!! Lots of fun/your pocket hairstylist! It's very easy to use and even if there is a part you don't understand you can find the solution on the info page. You'll have a blast and probably find hairstyles you never thought would work for you. There is 103 medium length styles alone! Not to mention if you do find some styles that you love you can save the picture to your camera roll, upload to Facebook or email it to someone for a 2nd opinion. Hope you use it as much as I have!! It's ok for a few giggles, but I didn't find it to be very helpful. I'm 42 and I found the styles to be either outdated (I'm talkin' the 80's) or meant more for teens. It also advertises that there are curly styles, And as I have naturally curly hair that is what I was most interested in but there are pitifully few of them, and most of those are more wavy than curly. I hope they add more styles as the app updates. This app is great! 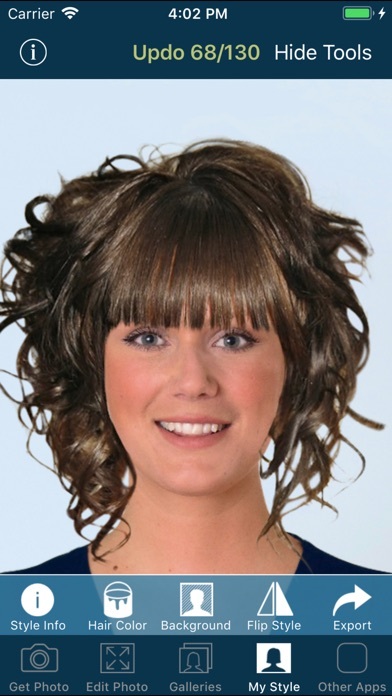 Lots of hairstyles and, as long as you edit your picture, it looks pretty realistic. I could sit here going though the different styles and colors all day. Love love live this app! I totally love this app, and used it when I went to the salon to get my most recent haircut. My friends and relatives love playing with it at get togethers. Had this app 3 years & haven't found one better. TIPS: use a full face forward pic of yourself and take your time lining up the guidelines. Good app to use on clients who dont know what they want. Worst hairstyles I've ever seen. Save your money. This app is so much fun! The hair looks real! I don't know why it doesn't have more reviews. Of course some hair styles are hilarious on me! And relatively realistic! Colors could be better. Love this app and definitely well worth the $1.99. Time can past by fairly quick trying on the different hairstyles and colors - it is pretty fun to see how you might look in a different color, straight or curly hair, and short, medium or long. May take getting used to making sure the style gets positioned properly on you, but the editing function often helps do the trick. Would love to see more hairstyles added on! I am having a great time with this app! I've gotten my next hairstyle narrowed down to the best 8 or 9! Love the choices of colors and options for photo sources. I found this app to be the most realistic when applying styles to a photo. Styles are modern and not outdated. Great variety of color with full version. Easy to use. Lots of hairstyles. My kids have a great time with this. I've been having lots of fun with this! I love this app! I have used it several times with my clients already! It is a great tool for hairstylist to have! There are many apps like this available on the Internet for free, but for $.99 this one is fun and useful. At first, I was incensed when it appeared that there were only 33 hairstyles for women and 9 for men, rather than the 270 that were advertised. I even emailed the developer to whine about it. The developer politely explained that I needed to SCROLL DOWN among the styles to find the rest. OK, I'd like to think I am tech savvy, but yesterday I was an idiot. It would be helpful to see an arrow to guide users to the rest of the styles, or a verbal reminder on the same screen. It would also be helpful to be able to adjust the shape of the blue face positioning guide: not all of us have skinny, oval faces. I love being able to plug in all the hair colors, safely, and without commitment! 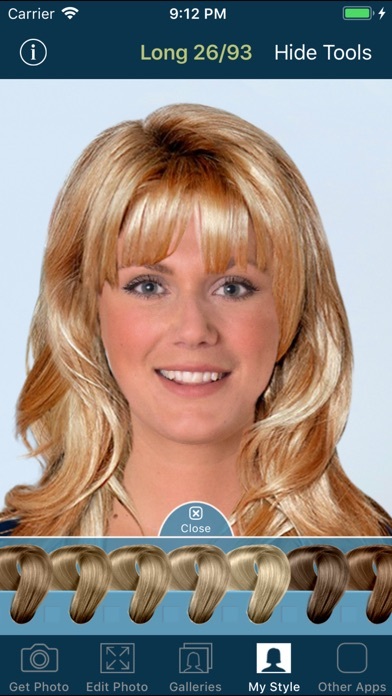 This is by far the best virtual hair makeover app I have found! So easy and so many styles. My husband and son even like for me to make them over! I am amazed at how accurately this app shows how one might look with different styles. Honestly these types of apps tend to be klunky at best but this one is really different. Can't wait to take these realistic photos to my stylist! Absolutely hysterical putting hair on everyone I know including myself. Most of the hairstyles look real. This app is so cool! I love trying on different hair/ beard styles. Great to kill time with friends! This app is soooooooo awesome!!!! I was blown away in how real some of the hairstyles look, and It was very helpful when my mom , me, or my sister had to get a haircut or wanted a new hair color! I hope that the makers of this app will keep perfecting it to make it even better! Also, it's soooooooooooooo much fun when you can make your friend have a new hairstyle andi I can email it to them. I hope that this app goes far. Oh ... And one other thing, you could have a hairstyle app for pets, maybe new ears and body colors,,, and actual hairstyles!!! Well, think about it... I gotta go to a big time rush concert, so byeee!!!!!!! This app is fun to use. So concise... Now we find a style that helps us Look our very best, while choosing The colors that we would like to Try but where to afraid to experiment. Not worth $2.99. Cuts are boring. No current trends. Bobs would be nice as an update at least.